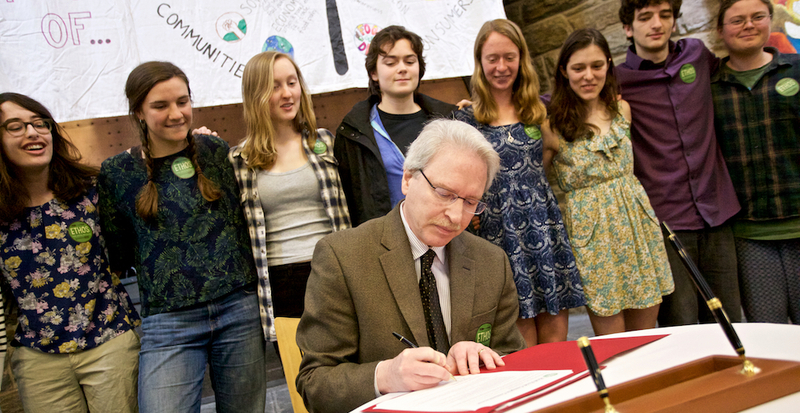 President Kim Benston signed the Real Food Challenge Campus Commitment in April 2016. Photo: Caleb Eckert '17. The Real Food Challenge is a national student-led movement that leverages the power of youth and universities to create a just and sustainable institutional food system. The national Real Food Challenge organization provides tools to institutions to support the development of a sustainable food economy, and provides networking opportunities, learning, and leadership development to thousands of emerging student leaders. The primary campaign is to shift 20 percent of existing university food budgets in the U.S. (equivalent to approximately $1 billion) from conventional agricultural products to local, ecologically sound, fair and humane products by 2020. Since 2008, students in the Real Food Challenge network have worked with their dining directors and other campus stakeholders to secure over $60 million worth of pledges to purchase more local, fair, sustainable, and humane food. This work has been done using two main tools: Real Food Calculator and the Real Food Campus Commitment. Our students were instrumental in getting the College to sign the Real Food Campus Commitment in 2016 as part of the Real Food Challenge national campaign. Haverford has pledged to purchase 20% "Real Food" by 2020. Since then, Haverford College students have been auditing our food purchases using the Real Food Calculator. They are part of our Real Food Working Group, a dedicated group of students, faculty, and staff responsible for coordinating the implementation of the Real Food Campus Commitment.